EMV stands for Europay, MasterCard and Visa. It’s the new global standard for cards equipped with computer chips, and the retail technology used to authorize chip-card transactions. have been set with the global introduction of EMV chip technology. We’ve been hard at work for months now, making sure EMV capability is incorporated into our credit and debit cards. Old-style cards have a magnetic stripe across the back that contains the financial information necessary to complete a transaction. The information it contains does not change from purchase to purchase— and that’s what fraudsters rely on when a card’s information is stolen and duplicated. An EMV chip–that small, shiny square on the front of the card– creates a unique transaction code that changes with every purchase, making it much more difficult for identity thieves to perform fraudulent purchases. 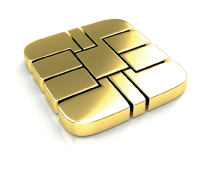 How will the EMV chip change my transactions? Before, you swiped and signed (or provided a PIN). With the new EMV chip, you’ll insert the card into the card reader and wait momentarily for authorization. You will then be asked to either sign or provide a PIN, depending on how the merchant is processing your card. The transaction will take slightly longer to complete compared to what you’re used to, but is much more secure. When will I get my new EMV credit or debit card from LMCU? In January of 2015 LMCU began issuing EMV credit cards to our members. Starting December 15, LMCU will begin issuing EMV debit cards to our members. You’ll receive your new EMV card when your old card is naturally set to expire. You can also call (616 or 800) 242-9790 ext. 9910, or ext. 9915 to request a new EMV debit or credit card in advance of your card’s natural expiration date. Our ability to instant-issue EMV debit cards at retail branches will be coming soon. As the rollout process continues, we’ll be providing additional information about how to use these new EMV cards. Contact LMCU’s Card Services department at (616 or 800) 242-9790 ext. 9915 with any questions.